Yoga for Health Institute created Beyond Cancer – Healing the Whole Being, a residential yoga intensive program designed specifically to follow cancer treatments. 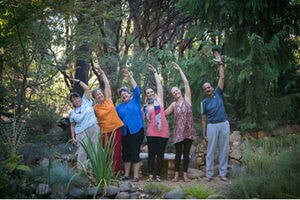 YogaLoka's director Natja is part of the Australian team providing cancer patients with insightful knowledge, along with the tools and techniques needed to recover from emotional and physical side effects of cancer treatment. Throughout the 21-day intensive retreat, we work to educate and empower our clients to connect and experience their own healing power so that they can regain a sense of control and balance, recovering the mind, body and spirit. I attended the retreat about 2 1/2 years after I finished treatment. It really doesn't matter where you are at in time after cancer as long as you want to take some control back, to find your feet back on the ground. The purpose of this retreat is to provide a platform post-treatment for clients to create their own healing at their pace. Beyond Cancer will restore the body and mind from the harmful side effects of cancer treatments, which many people continue to carry with them for years afterwards. We present Yogic tools, which help our clients to move from a state of victim-hood to a state of empowerment. Even joining the retreat as a Yoga teacher had amazing results. Practices I knew were reinforced or deepened and I learned new techniques. ​I can only imagine how mind-blowing it is for others. 3 weeks seems long but you will understand afterwards that it is exactly the length it needs to be or shall I say feel instead of understand. The Beyond Cancer Retreat was created at Kaivalyadhama Yoga Institute in India and has been successfully helping cancer patients since 2013. We use evidence-informed Yogic tools such as; meditation, Yoga Nidra, chanting, breathing techniques, postures, and vegetarian diet. In Beyond Cancer Retreats, we provide our clients with research material on carcinogenic factors in our every day lives. We educate clients on how to employ natural methods to reduce stress, increase energy levels, and strengthen their immune system to prevent re-occurrence of cancer. Intensity and commitment. The duration of this retreat is the key to our client’s success in recognising change within themselves. In these 3 weeks, clients will observe harmful patterns/habits and internalise new ones. Our participants are encouraged to become aware of what works for them and we develop a personal plan together for home practice after the retreat. Our unique experience-based learning approach leads to 80% of participants continuing their new lifestyle habits once they return home and maintaining all the positive benefits. Over the course of the retreat, suppressed emotions come to the surface and can be uncomfortable. Throughout the 3 weeks together, the Beyond Cancer facilitator will hold a daily “office hour” for drop-in counselling to support those who may need it. Schedule may be subject to slight changes. The Group Activities include health education, yogic counselling and therapeutic group work. We will help you to examine your attitude to life and identify your personal goals to create a well-balanced and fulfilling life. ​and will be prepared in the Ashram according to nutritious vegetarian diet. Accommodation is in a triple room. Upgrades to twin or single rooms are available upon request and availability, surcharges apply. 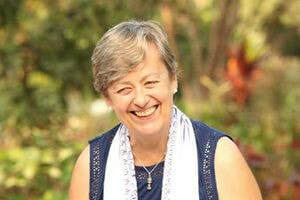 ​Lee Majewski, MA, DYEd, C-IAYT is a senior Yoga Therapist at Kaivalyadhama Health and Yoga Institute in India. Her own journey through cancer bought home the value of ancient Yogic methods and techniques to facilitate self-empowerment and healing in her life. Daily yogic practices have helped her immensely to cope with the negative side effects of her allopathic cancer treatment. Natja Wünsch received her Advanced Diploma of Yoga Teaching from the Australian Yoga Academy in July 2010. She studied Kids Yoga Therapy with Zenergy in March 2012 right after being diagnosed with breast cancer. Almost straight after treatment she started Yoga after breast cancer with Annette Loudon in 2 workshops and distant study to complete with certificate. A second round of breast cancer and further self-study through different treatment made her wish to help and work with others after cancer even stronger. Natja added Lymphatic Yoga with Annette in April 2017 as it is a vital part for cancer recovery. She works with people in and after cancer in private as well as group settings and has founded Move After Cancer courses. Natja attended the Beyond Cancer Retreat in 2018 for herself as well as to experience the retreat to deepen her knowledge to help others after cancer. Please contact Natja in regards to all questions, enquiries and bookings for the Beyond Cancer Retreat in Victoria – Australia – in 2019. Prices include the retreat program as listed in the schedule, breakfast, lunch, afternoon tea and dinner, tea with the meals and drinking water as well as accommodation in a triple room. Twin and single rooms can be request and depend on availability, prices are as stated below. You can find more information about the retreat and the founder, Lee Majewski on the Yoga for Health Institute page. If you are interested please don't hesitate to contact me, Natja on the phone: +61 402 322 145 or via email. I have lots to tell as I attended the retreat in 2018. The retreat was a full success for me!